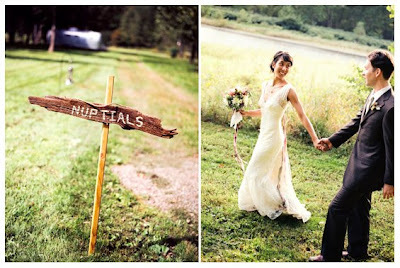 I love how the "nuptials" sign is kinda mustache shaped. Have I been sitting at my computer too long? Visit photographer Robert Sukrachand's blog to see more photos of this upstate New York campground wedding. The air stream trailer (pictured in the background above). The vintage Volvo. These woodsy centerpieces. i love how mustaches are in style! to hell with waxing! 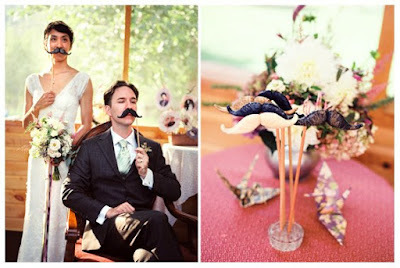 I'm actually going to grow a 'stash for my wedding. Whenever that's going to happen. I was also thinking about chest hair. Are those chocolate moustaches?? Yum. I think they are chocolate! Awe-some. koala, you have obviously never seen Mark Ruffalo in In The Cut. did I say I didn't like engagement photos? can I get an oh yeah? I confess. I'm a total wedding snob.